This is a hosted media event. Whenever I travel, I reach out to people on social media to find out where the best places to eat are. Because everyone knows I have a raging sweet tooth, most of the suggestions are ice cream shops and bakeries. The last time I'm in San Francisco, about a dozen people tell me I need to visit Mr. Holmes Bakehouse. "What a peculiar name," I think. I don't get a chance to visit, but it sticks in my head. And sure enough, it continues to permeate my virtual world, even outside the Bay Area. The bakery is known for their "cruffin" which is croissant meets muffin, with a jam/cream filling. Unfortunately they aren't serving them the evening I go, but we do get three pastries of our choice. I don't pick anything chocolate (like this monkey bread) because I will be spending an hour and a half driving in the hot car. I wind up with a Fruity Pebble cream-filled Donut, a savory Bacon Danish, and one of these Chocolate Bread Pudding Slices. Combining forces with my friends Lily Diamond and Alana Kysar's selections to form an Instagram-worthy shot. I am bringing my box to Book Club and sharing it with my buddies. They are mind-blowingly delicious. After one bite, my friend Rachelle Wood and I each rip that donut in half with our hands and tear through it like wild beasts. Here's praying that this sign I recently spotted on Larchmont means a cruffin will be within walking distance of me someday. 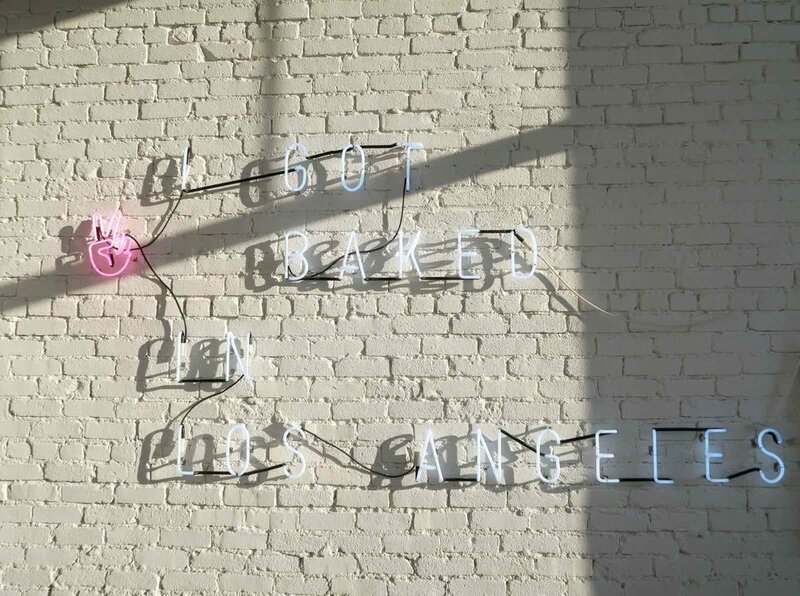 Mr. Holmes Bakehouse is in Highland Park at 111 S Avenue 59 Los Angeles, CA 90042.